I first heard about book futons in graduate school at the University of Texas at Austin. It may be that the futon originated there. I am unsure of their provenance but I am fairly certain the conservators at the Harry Ransom Center made book supports of various kinds and likely futons were in the mix. My first memory of finding instructions for making futons was in Book Displays: A Library Exhibits Handbook by Anne C. Tedeschi (Highsmith Press, 1997). Her depiction of how to make a futon was pretty good, but there were things about her futons that I wanted to change. So I embarked on a mission to make my own version. I even recruited my mother, an expert seamstress, to help. We have made a lot of futons over the years. A fleet of futons ready for use in the Rubenstein Library. Together we perfected our methods and ultimately wrote our own instructions for constructing three sizes of futons. You can access a PDF of our futon instructions here. This PDF includes sewing instructions, laundering information, and an illustrated guide on how to use them. The instructions should be easy to follow if you have a basic understanding of sewing or quilting. Feel free to email me if you have questions. What’s So Great About A Futon? Inexpensive to make. 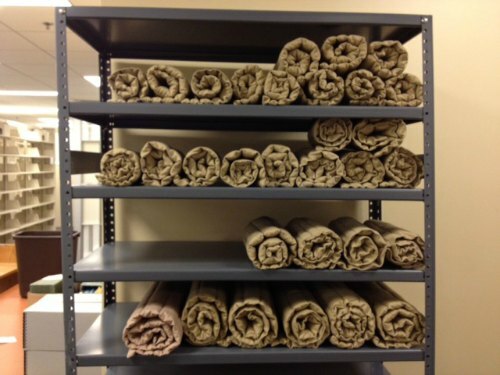 Craft stores often have sales or issue coupons for 40-50% off fabric and batting. We use futons in the reading room, the conservation lab, the classroom, and even for temporary exhibits and show-and-tells. Do you know the history of the book futon? Have you made your own futons? Share your futon story in the comment section. 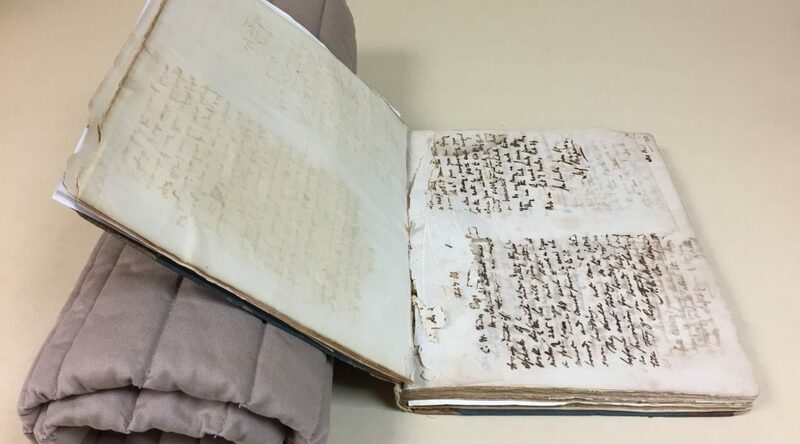 Last month, Senior Conservator Erin Hammeke shared her treatment of a caoutchouc binding, which incorporated a clamshell enclosure with integrated cradle. There are many items in the collection that can benefit from an enclosure like this (henceforth referred to simply as a “cradle box”): books which require a restricted opening to reduce the risk of further damage, collection material that is used frequently, or items that are exhibited at library events outside the reading room. Our History of Medicine Collection has several items which meet these criteria and everyone in the lab was interested in learning how to make a cradle box. This week we dedicated a boxing day to this project, which served both as a training exercise and supports use of the collection. While several variations on structure are described in publicly available resources (see the AIC Wiki), we decided to all just stick with Jeff Peachey’s design. 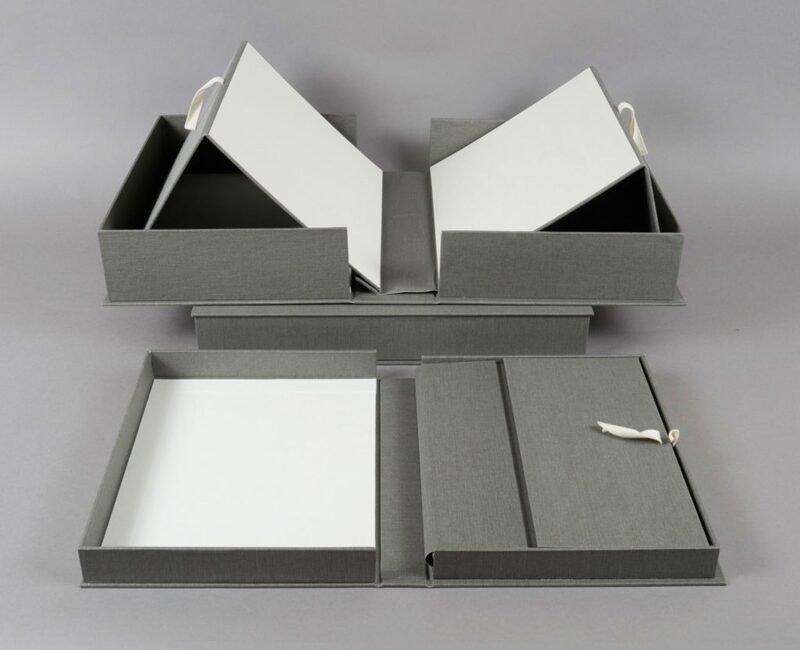 The benefits to this design are that the cradle fits the book very well and is attached to the box, so you don’t have to worry about it being removed and getting lost. We could also rely on Erin’s previous experience and help each other through the more complicated steps! Construction begins by measuring the book at the intended opening angles to determine the sizes of the individual parts of the cradle. As with measuring for exhibit cradles, it’s much easier to prop the boards up with cushioned weights before taking measurements. … and covered in book cloth. The cradle is essentially constructed in two pieces, which are attached by a cloth spine piece. The image below shows the interior of one cradle side during covering (left), including the adhered ends of cloth tape that allow the user to lift up the cradle (right). Once the cradle is complete, the book is placed inside and the entire sandwich is measured for the clamshell box. The box is constructed in the usual way, but the right side of the cradle is attached to the interior of the smaller tray near the spine. It was a lot of fun to approach learning this enclosure design as a group. If one of us hit a roadblock or did not quite understand the next step in the instructions, we could all talk it through together. Over the course of the day, we developed new techniques for completing steps or learned from each other’s mistakes. And, more importantly, now six more books from the collection will have cradles with them wherever they go! Washing paper is deeply satisfying. In the lab today are some beautiful maps that will be loaned to Duke University’s Nasher Museum for an exhibit in the fall. 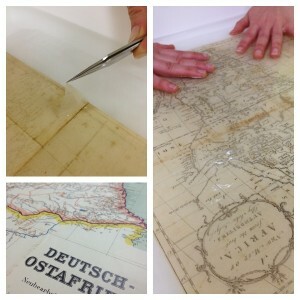 While most of the maps are in good condition, some need conservation beforehand. Rachel has been doing some dry cleaning, and Grace is washing a few to remove old repairs and stains. Once the conservation is done, we will help to mount them so they can be matted and framed at the Nasher. This week will be your last opportunity to see our exhibit “What’s Missing From Your Video History” sponsored by the Preservation Department and the Digital Scholarship and Production Services. 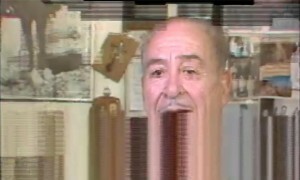 Audio-visual materials’ rapid deterioration (relative to print media), its wide adoption for commercial and personal use, and the range of formats and playback equipment that rose and fell around analog videotape, have profound implications for preserving those pieces of our 20th century history that were captured on videotape. The exhibit is on Perkins Lower Level 1, outside the Digital Production Center, near room 023. Open during library hours. 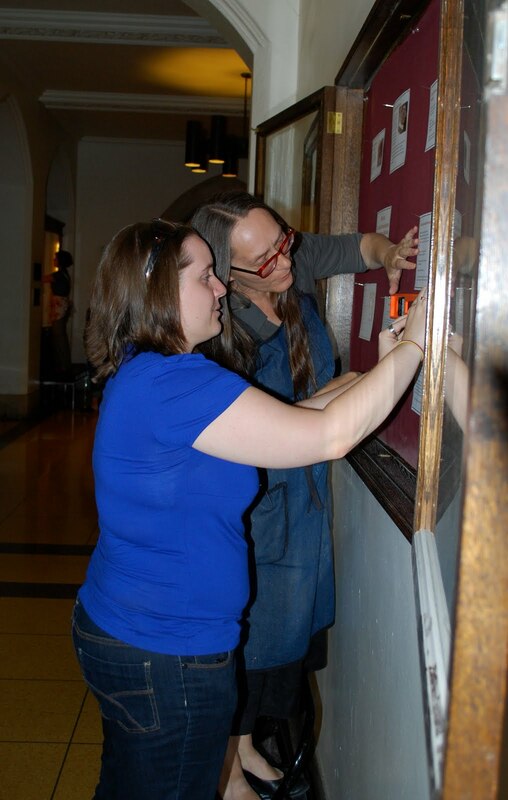 This year marks the Preservation Department’s tenth year serving the Duke University Libraries. 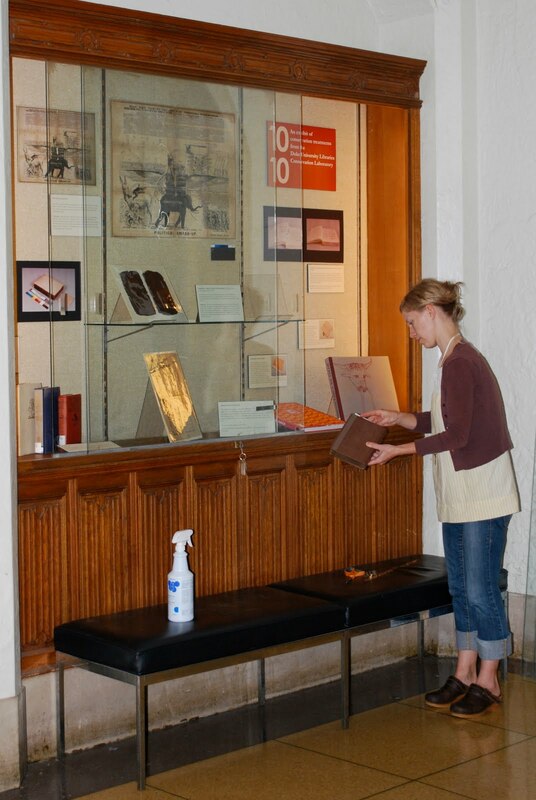 This exhibit celebrates the work of the conservation laboratory by displaying a variety of different treatments from the libraries collections. The department is planning several events to mark the occasion which includes this exhibit, an open house, and interviews with staff members; for more information visit Preservation Underground. The Preservation Department’s new exhibit highlights work from the Triangle Research Libraries (TRLN) Master Bookbinders Group. Our group consists of staff members from the conservation labs of UNC-Chapel Hill, NC State and Duke University libraries. 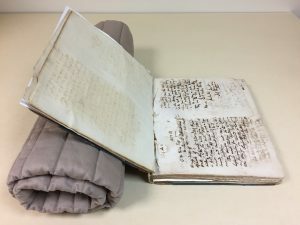 Its purpose is to research historic bookbindings to deepen our understanding of the history of the book, and develop knowledge and skills that help inform our daily conservation work. Our new exhibit it up! 10 Projects: Analog to Digital highlights some of our favorite digitization projects from the Digital Production Center. For the past five years the men and women in DPC have worked to bring our collections to new life in digital format. You can find these collections through Duke Digital Collections. For more on the DPC staff, search our site for our Ten Years, Ten People posts. You might also want to follow the Digital Collections Blog, one of many blogs hosted by the Library. The exhibit is open during regular Perkins/Bostock hours. We are located on the Lower Level (same level as the Link), by Room 023. Our new exhibit highlights work from the Triangle Research Libraries (TRLN) Master Bookbinders Group. Our group consists of staff members from the conservation labs of UNC-Chapel Hill, NC State and Duke University libraries. Its purpose is to research historic bookbindings so we can deepen our understanding of the history of the book, and develop knowledge and skills that help inform our daily conservation work. 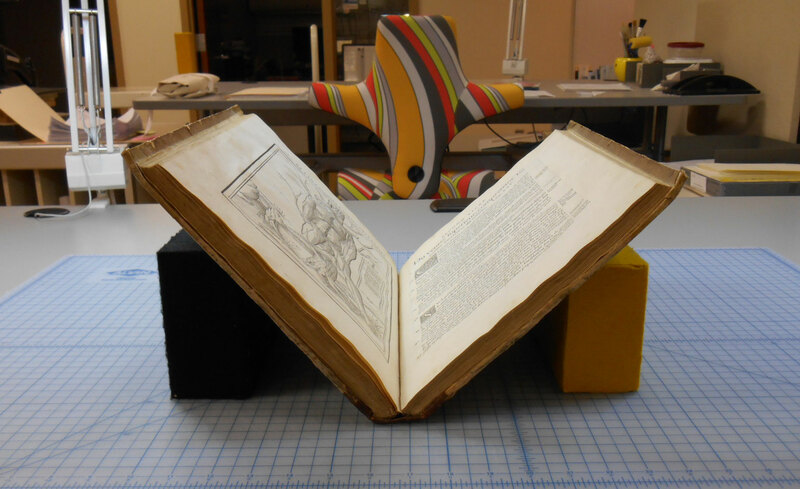 Creating binding models is a traditional form of learning the craft of bookbinding and the history of the book. Each quarter we assign a binding style to one or two of our members. Our volunteer teachers research the history of the binding and how it was traditionally made, and demonstrate it to the rest of the group. We then make our models, sometimes recreating the binding exactly and sometimes interpreting them more artistically. The exhibit will be up through January 2011, just outside the Conservation Lab in Perkins Library 023. It is open when the library is open. 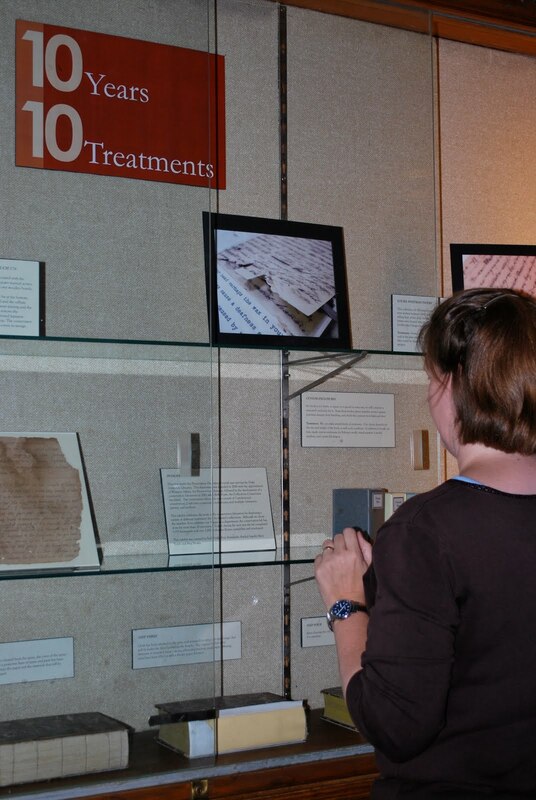 Yesterday we installed our exhibit “Ten Years, Ten Treatments.” As part of our year-long celebration of our tenth anniversary, we wanted to highlight some of our favorite work. The exhibit is outside the Biddle Reading Room on the first floor of Perkins. While there, you can also see our display in the wall cases (on the opposite wall from the exhibit) that gives ten tips you can use to save your personal collections. Our exhibit will be up through mid-October. We are planning a companion exhibit of Ten Projects from the Digital Production Center to be installed in our exhibit space on the Lower Level of Perkins outside the Conservation Lab. Hopefully we will have that up next week, we’ll let you know when that happens. 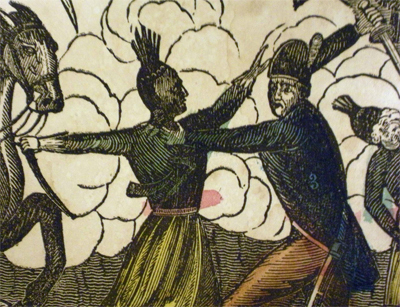 Our current exhibit, “Mixed Blood: Conservation Work and Decision-making in Support of the Study of Racial History,” will be coming down in about a month. If you haven’t had a chance to see this wonderful display by Mary Yordy, Senior Conservation Technician, please stop by the Lower Level (outside room 023) when you have a few minutes. It’s worth the trip to the Underground.